A few years ago while sailing a boat back from Hawaii, we skirted the North Pacific High. This is a pressure zone midway between the mainland and the islands. Along the margins is the great current that circulates around the Pacific concentrating flotsam into what is known as the North Pacific Gyre. Now considered the “Great Pacific Garbage Patch”, we pass fishing buoys, old nets and plastic bottles. Small colorful bits of plastic bob on the waves as shearwaters swoop down to investigate them as food. We pass a refrigerator overgrown with barnacles, but most of the debris is plastic. Work from the Algalita Marine Research Foundation indicates there is six times more plastic than phytoplankton (single-celled marine algae) per weight and fifty times more plastic than zooplankton (small crustaceans and larvae) in the North Pacific Gyre. Over half this plastic is plankton size: less than 60 mm or a quarter-inch in size. These tiny plants and animals are the base of the ocean food web, and animals consuming plankton from herring to whales are ingesting plastic. The plastic doesn’t go away, it just gets smaller. Approximately 70% of plastic sinks to the bottom where it sits like a time bomb waiting to be assimilated. The larger pieces float along until cast ashore or ingested by a marine animal. Plastics absorb organic pollutants like toxic sponges, concentrating the poisons and finding their way into the food chain from fish to humans. One study found fulmars, ocean-going birds that visit our waters, have over 30 pieces of plastic in their stomachs. A sea turtle found dead off Hawaii had over 1000 pieces of plastics in its intestines. 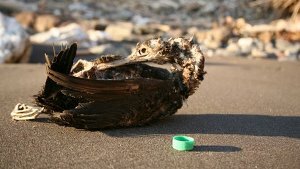 Hundreds of thousands of seabirds, sea turtles and marine mammals die from plastic ingestion each year. Americans generate 10.5 million tons of plastic waste a year but recycle only 1 or 2% of it. An estimated 14 billion pounds of trash – most of it plastic – is dumped in the world’s oceans every year. Plastic bags and other plastic garbage thrown into the ocean kill as many as 1 million sea creatures every year. This problem occurs in every ocean in the world. We are killing our wildlife and poisoning ourselves through a preventable problem. For hundreds of miles of ocean, patches of plastic cross our bow. A sailboat is like a small planet: we have limited food and water and we generate waste. On past Sea Stewards expeditions, we are careful to keep all plastic aboard, and minimize plastic wrapping and bags in our provisioning. No plastic goes into the ocean on our watch. We can reduce our waste using less, bringing your own bag to the grocer and using a metal water bottle. Join us and hundreds of thousands of Californians on September 17, California Coastal Clean Up Day. You can participate at one of the regular clean ups organized by your local Surfrider Foundation or start your own. Plastics reduction and marine debris clean up is part of Sea Stewards Healthy Oceans Initiative. Watch Plastic in the Pacific to learn more about the Great Pacific Garbage Patch.